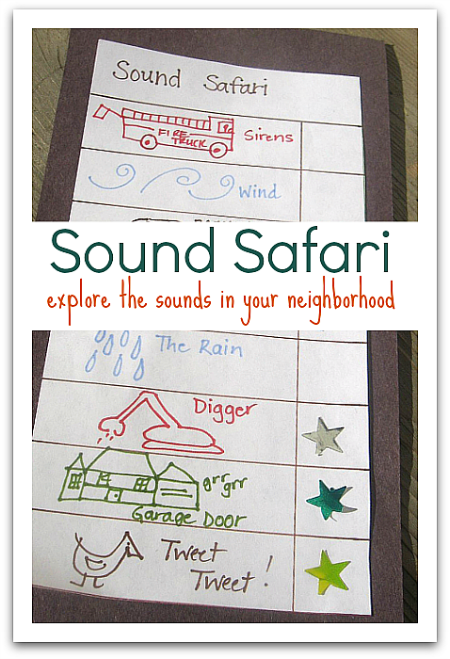 I had no clue how well this sound safari would work with my 23 month old, I have done it with 3- 5 year olds in the past but never with toddlers. It was a huge hit. 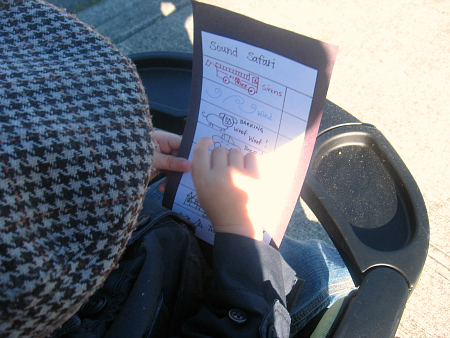 He understood the chart and that we were listening to for the things listed and got very excited to earn each star. We chose to go for a walk in our neighborhood but you can do this inside or in your backyard as well. Gather your materials. 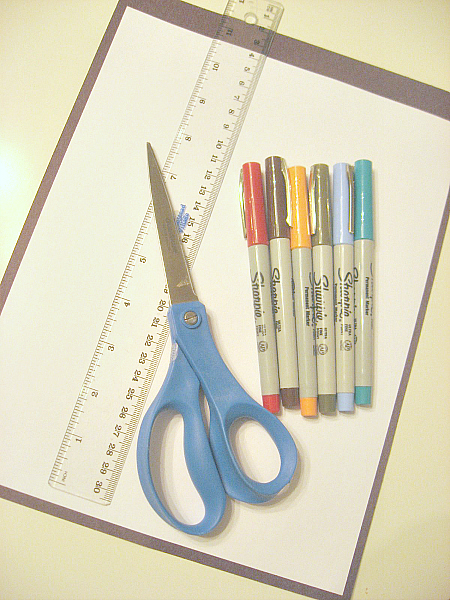 You will need some construction paper, plain paper, markers, a ruler, scissors, stickers and glue or double stick tape. 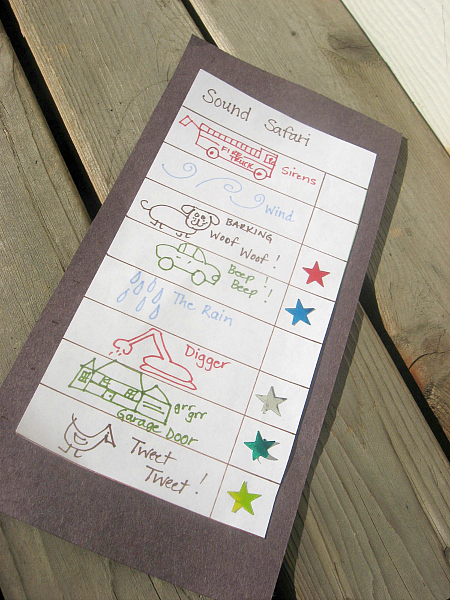 Make a simple chart , one space for the sound you are searching for and a small box for a sticker or a check mark. 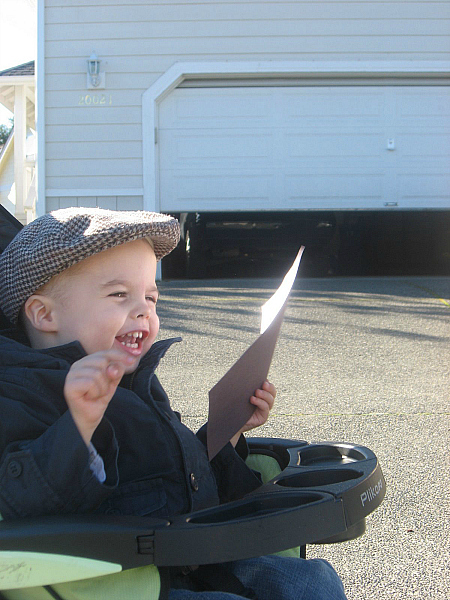 Tape or glue the paper on the construction paper and head off on your walk. I gave the chart to my son and told him we were looking for all those sounds, we talked about hearing things, and although he was quite convinced we hear with our eyes, he still got it. I helped start things off my closing the garage door and asking him what he heard. when he said the garage door , I asked him to look on his chart to see if that was on it. When it was we got a sticker and put it in the box. Previous Post: Sent In By You! 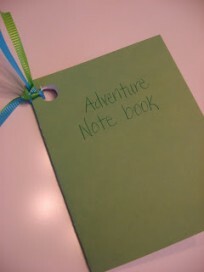 A friend sent me a link to your site months ago and I have been loving the ideas! You son is about the same age as one of my boys so I can always see whether it might be doable for us. I love this idea! Thank you so much for sharing your ideas and talents with us! Check this out. There’s something for you. AWE.SOME. 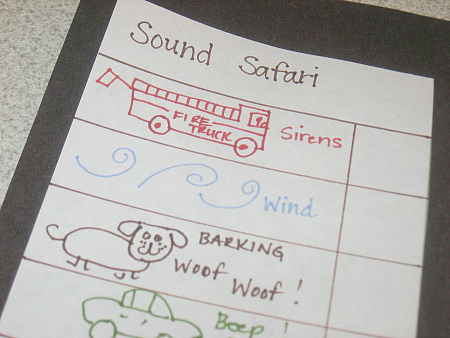 Looks like I’m going on a sound safari! 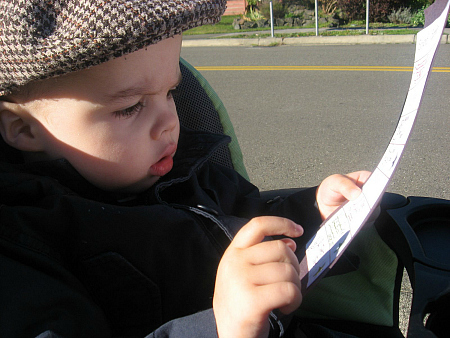 really cute we make up ispy list when we go to the zoo or childrens farms and on long car rides! Oh the craft is a cute one, but I just can’t get past that jaunty hat he’s wearing!!!! SO cute! I am so happy to see so many comments, I was worried this would be a big flop even though we had such a great time doing it. Nicole I will head over there in just a sec! Brenda- yeah he loves hats especially that one, he is almost always in it. It’s a by product of me always covering his cradle cap as a baby. He looks so precious and serious studying his list! I like the idea of using the stars. I’ve been meaning to come up w/something like this akin to BINGO or some such for long car trips where the children can look for certain items, shapes, types of places, etc. Now, to just get it done! Cab- I know he takes after his dad with his serious side. I have very few serious moments a year ! I couldn’t believe how much he loved it and really got it, I am still in awe. Now if I can just get him to stop eating paint…and glue! 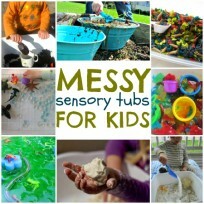 I’ll have to try this activity with my little girl. She is always noticing sounds all around her. Thanks for the great idea! My 3-year-old will love this! That’s so awesome! We’re always “listening” for new sounds around here. Even before they were one, both of mine loved pointing to their ears whenever they would hear an exciting sound such as the lawnmower, or a dog barking, or a bird chirping. It’s a great way to teach them to pay attention to their surroundings, but I never even thought about making it into a chart/game. Love it! I am doing a Summer Bucket List post and was wondering if I can use one of the pics in the Sound Safari post and provide a link to your blog? yep! One pic with a link is perfect, thanks for asking.